The market for communications ASSPs has become fragmented across both end-use categories and geographies. In Ethernet, data centers are driving growth while the traditional enterprise market languishes. In broadband, PON is growing rapidly in China while DSL is losing share. Meanwhile, the supply base, once populated by a mixture of startups, midsized companies, and a few big companies has become increasingly concentrated. With more technologies under its roof, the typical chip supplier is better able to integrate system functions into a single chip to lower system cost. With fewer competitors, the supplier is also more likely to avoid the ruinous price wars that once plagued product markets such as DSL. How all these factors come into play affects our outlook for communications semiconductors. Companies seeking to understand these dynamics will benefit from the perspective of the leading group of communications semiconductor analysts. "Communications Semiconductor Market Forecast 2017–2022" provides the detailed market information needed to sort out the complexities of this market. With this report, chip vendors, investors, and OEMs will readily see how big the mature product markets are and how fast the emerging categories are growing. Communications semiconductor product categories covered in the report include network processors, 10-, 25-, 40-, 50-, 100-, and 400-Gigabit Ethernet components, PON and VDSL transceivers, cable modems, network search engines, home-networking chips, and optical-transport ICs. 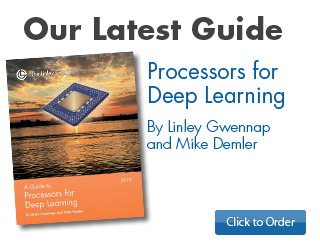 New to our last edition is a forecast for optical-interface components, which comprise CDR, TIA, and driver devices used in optical modules. Also included are forecasts for FPGAs, embedded processors, server processors, and integrated base-station processors used in small cells. 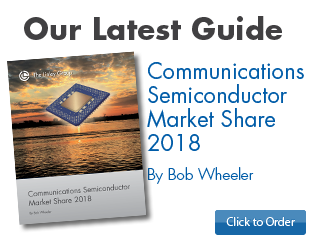 The report includes a brief text summary providing analysis of the data and a set of tables for more than a dozen categories of communications semiconductors. The single-user license includes summary analysis of the data and is packaged with a non-printing PDF that provides market-forecast tables for more than a dozen product categories. The corporate license includes a PDF that permits printing. For easier data reuse, the corporate-license edition is packaged with a Microsoft Excel workbook containing all of the data. As the leading vendor of analysis for communications silicon, The Linley Group has the expertise to develop a high-quality set of market estimates. Our analyst team applies its extensive experience and network of industry contacts to deliver the quantitative information you need to make informed business decisions. Whether you are looking for a well-established vendor to source from, a vendor to partner with, or a rising company to invest in, this report will cut your research time and save you money. 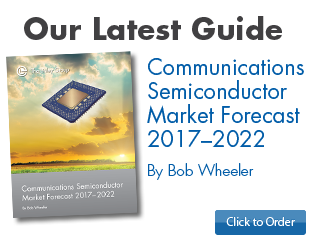 Order "Communications Semiconductor Market Forecast" today. Product managers and executives seeking to identify product markets in which to invest or divest. 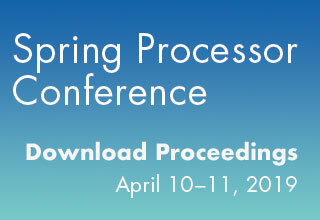 Strategic sourcing professionals and engineers at OEMs seeking information about pricing and other chip-market trends. Investors and financial analysts seeking data to support investment decisions. Provides 2017 market sizing and revised forecasts through 2022. New forecasts for 400G Ethernet switch and PHY chips. The Linley Group has developed forecasts of communications ASSPs for wired applications, embedded microprocessors, and FPGAs using infor-mation gathered in its market-share process, from public financials and other public sources, and from reviewing spending and technology trends. This report also includes our forecasts for server processors and integrated base-station processors. Through the first half of 2018, the market for chips sold into communica-tions systems was mixed. Although the Ethernet segment is poised for full-year 2018 growth, China-related events are negatively impacting several other segments. In total, we expect wireline-communications-ASSP revenue to grow a modest 1.2% in 2018. Sales of embedded processors into communications should show strong year-over-year growth, benefiting from growth in cloud data centers. FPGAs will fare worse than ASSPs and processors owing to their exposure to wireless infrastructure. Overall, we expect communications equipment will consume $13.9 billion in ASSPs, processors, and FPGAs in 2018, up from $13.5 billion in 2017. We expect growth in only two ASSP segments in 2017, while the broadband segment will be relatively flat. Growth in Ethernet, however, will more than offset the decline of other segments. Driven by hyperscale data centers, sales of 25Gbps and faster Ethernet are rising. In broadband, 2018 consumption should better correlate with end-market demand following the 2017 PON inventory correction. Conversely, optical-interface ICs have yet to fully recover, leading to our weak outlook for 2018. Beyond 2018, the picture is much the same for the largest segments, as Ethernet continues to grow while wired-broadband slows. As 10G Ethernet expands beyond the data center, the largest data centers are deploying 25G, 50G, and 100G Ethernet. In broadband, China’s conversion of DSL subscribers to FTTH (PON) is nearing completion. CPE upgrades and technology transitions will replace subscriber growth as the major drivers in broadband. Wireless operators that have completed LTE build-outs will maximize use of existing macro base stations through 4.5G upgrades. The small-cell market will remain modest until 5G rollouts boost growth in 2019 and beyond. We also see a growing market for integrated base-station processors in macro base stations, where they will displace general-purpose DSPs. Ethernet chips will provide most of the communications-ASSP revenue growth from 2017 to 2022, according to our forecast. The hottest trend is the emergence of 25G, 50G, and 100G Ethernet, which ramped into volume in 2016. Whereas past Ethernet speeds have taken years to reach high volumes, deployments by hyperscale data-center operators are driving much faster growth for these new rates. Enterprise (private-cloud) data centers will consume a mix of 10G and 25G Ethernet. Enterprise-access switches will increasingly consume 10GbE components to handle Wi-Fi access points equipped with 2.5GBase-T ports. Broadband subscriber growth is leveling off, and with it the number of broadband CPE ports shipped. Fortunately, competition between service providers drives customer churn, helping increase CPE shipments. Competition also fuels network upgrades, again creating demand for new CPE. The increasing complexity of CPE also supports higher average chip prices (ASPs) as gateways support faster data rates and improved Wi-Fi capabilities. Enabling telcos to offer gigabit-class services to compete with cable and fiber, Gfast is emerging as an alternative to VDSL2 in fiber-to-the-distribution-point topologies. Compared with communications ASSPs, both embedded processors and FPGAs have greater exposure to wireless infrastructure. They also serve large markets outside of communications. Both categories were impacted by the wireless-infrastructure decline in 2015, leading to a rebound in 2016. In 2017, wired networking lifted embedded-processor sales, but FPGA sales in communications were nearly flat. We expect good growth for embedded processors and FPGAs over the next five years. Communications, the largest application for embedded processors, has a mixed outlook. A significant portion of these processors goes into base stations, and we expect this segment will decline through 2021. On the other hand, we expect embedded-processor revenue from switches, routers, and security equipment will grow substantially. Thus, wireless infrastructure becomes a smaller contributor to overall revenue from communications by the end of this forecast period. We track sales of FPGAs into communications and other applications. The downturn in wireless infrastructure severely impacted FPGA sales in communications, and we do not see a return to 2014’s level until 2020. By that year, 5G wireless deployments will have restarted growth. In the meantime, wired-infrastructure designs have stabilized FPGA sales in communications. FPGA sales into other applications posted strong year-over-year growth in 2017 and have an excellent outlook. A number of new applications will drive growth, including server acceleration, deep learning, and advanced driver-assistance systems in cars. Complementing our comprehensive market-share report, this document provides investors, product-marketing staff, and executives with insight into the state of the communications IC market and key trends. Extending our ongoing coverage of the industry, it outlines both our quantitative estimates and the important assumptions behind them so that readers can better integrate our forecasts with other information they may have. Figure 1-1. Taxonomy of wired-communications ASSPs. Figure 1-2. Industry revenue of wired-communications ASSPs by product category, 2017–2022. Figure 1-3. 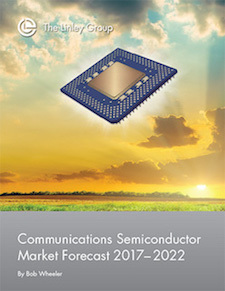 Industry revenue of select general-purpose semiconductors, 2017–2022. Figure 2-1. Industry revenue of network processors by segment, 2017–2022. Figure 2-2. Industry revenue of embedded microprocessors by application, 2017–2022. Figure 2-3. Industry revenue of embedded microprocessors by communications sub-application, 2017–2022. Figure 2-4. Industry revenue of integrated base-station processors by cell size, 2017–2022. Figure 2-5. 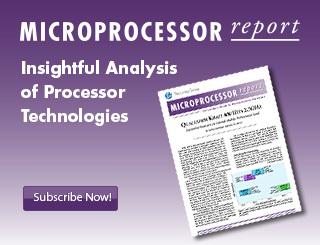 Industry revenue of server microprocessors by market segment, 2017–2022. Figure 3-1. Industry revenue of Ethernet ASSPs by speed, 2017–2022. Figure 3-2. Industry shipments of Ethernet-switch ports by speed, 2017–2022. Figure 3-3. Industry revenue of ASSPs for Ethernet switching by speed, 2017–2022. Figure 3-4. Industry port-shipments of ASSPs for Ethernet adapters by speed, 2017–2022. Figure 3-5. Industry revenue of ASSPs for Ethernet adapters by speed, 2017–2022. Figure 3-6. Industry shipments of Ethernet-PHY ASSPs by speed/media, 2017–2022. Figure 4-1. Industry port-shipments of ASSPs for broadband CPE by technology, 2017–2022. Figure 4-2. Industry revenue of ASSPs for broadband CPE by technology, 2017–2022. Figure 4-3. Industry port-shipments of ASSPs for broadband infrastructure by technology, 2017–2022. Figure 4-4. Industry revenue of ASSPs for broadband infrastructure by technology, 2017–2022. Figure 5-1. Industry revenue of ASSPs for optical transport networks, 2017–2022. Figure 5-2. Industry revenue of optical-interface ICs, 2017–2022. Table 1-1. Industry revenue of wired-communications ASSPs by product category, 2017–2022. Table 1-2. Industry revenue of select general-purpose semiconductors, 2017–2022. Table 2-1. Industry revenue of network processors by segment, 2017–2022. Table 2-2. Industry revenue of embedded microprocessors by application, 2017–2022. Table 2-3. Industry revenue of embedded microprocessors by communications sub-application, 2017–2022. Table 2-4. Industry revenue of integrated base-station processors by cell size, 2017–2022. Table 2-5. Industry revenue of server microprocessors by market segment, 2017–2022. Table 3-1. Industry revenue of Ethernet ASSPs by speed, 2017–2022. Table 3-2. Industry shipments of Ethernet-switch ports by speed, 2017–2022. Table 3-3. Industry average ASSP cost per port for Ethernet switches by speed, 2017–2022. Table 3-4. Industry revenue of Ethernet-switch ports by speed, 2017–2022. Table 3-5. Industry port-shipments of ASSPs for Ethernet adapters (MAC and MAC-PHY ICs) by speed, 2017–2022. Table 3-6. Industry ASP of Ethernet-adapter ASSPs by speed, 2017–2022. Table 3-7. Industry revenue of Ethernet-adapter ASSPs by speed, 2017–2022. Table 3-8. Industry port-shipments of PHY ASSPs for Ethernet by speed/media, 2017–2022. Table 3-9. Industry ASP of Ethernet-PHY ASSPs by speed/media, 2017–2022. Table 3-10. Industry revenue of Ethernet-PHY ASSPs by speed/media. 2017-2022. Table 4-1. Industry port-shipments of ASSPs for broadband CPE, by technology, 2017–2022. Table 4-2. Industry ASP of ASSPs for broadband CPE by technology, 2017–2022. Table 4-3. Industry revenue of ASSPs for broadband CPE by technology, 2017–2022. Table 4-4. Industry port-shipments of ASSPs for broadband infrastructure by technology, 2017–2022. Table 4-5. Industry ASP of ASSPs for broadband infrastructure by technology, 2017–2022. Table 4-6. Industry revenue of ASSPs for broadband infrastructure by technology, 2017–2022. Table 5-1. Industry revenue of ASSPs for optical transport networks, 2017-2022. Table 5-2. Industry revenue of optical-interface ICs, 2017–2022. Table 5-3. Industry revenue of network-search-engine ASSPs, 2017–2022. Table 5-4. Industry revenue from home networking and access ASSPs, 2017-2022. Table 5-5. Industry revenue of other wired-communications ASSPs, 2017-2022. Table 5-6. Industry revenue of FPGAs for communications and all other appli-cations, 2017-2022.